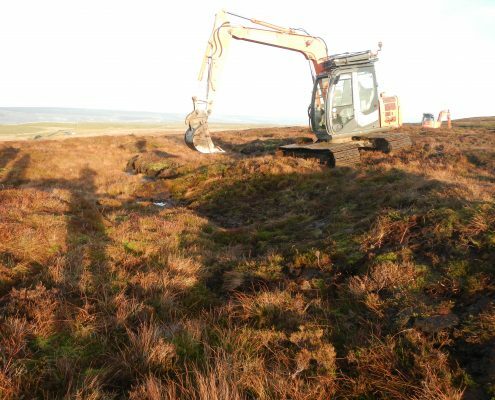 Conservefor are a specialist Moorland Restoration Contractor and were appointed by the Yorkshire Peat Partnership to undertake the restoration of Thoralby Common above Bishopdale in North Yorkshire. Thoralby Common is at an altitude of 548m and covers an area of 88 hectares containing heavily degraded grips, gullies, hags and large areas of bare peat. Re-profile and revegetate 3780m (1.89ha) of eroded gully sides. 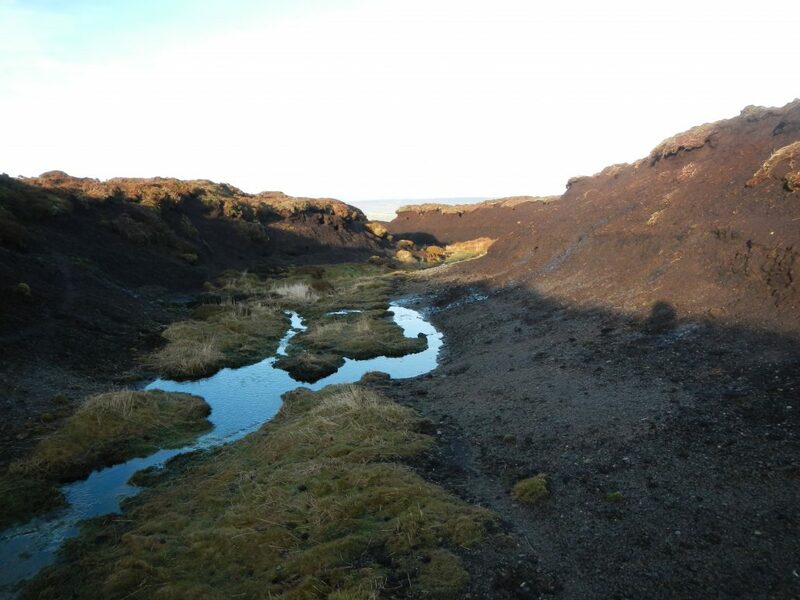 Re-profile and revegetate 6358m (1.91ha) of eroding peat hags. 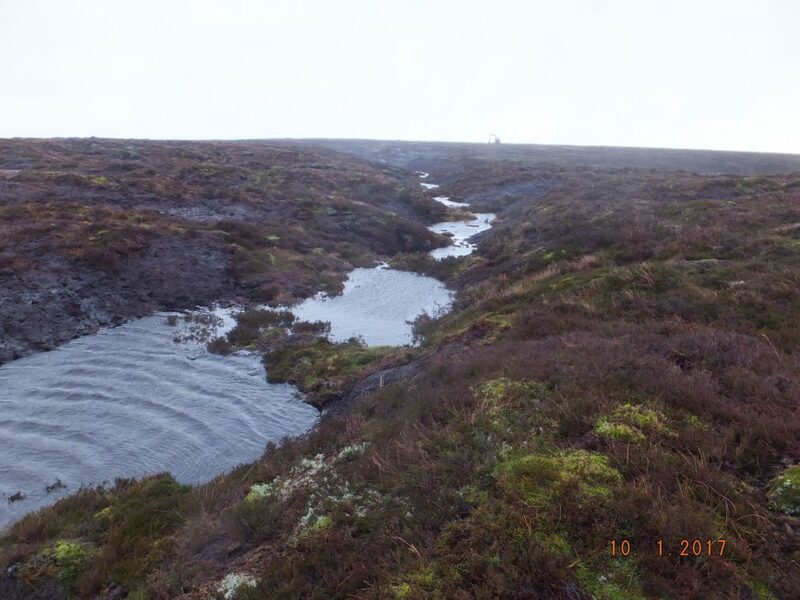 Install 291 small peat dams to be used as sediment traps. Revegetate 1.52ha of bare peat and mineral soil. Supply and plant 7600 Common cotton grass plug plants. Supply and plant 5225 Sphagnum plugs. Supply and spread 60.80kg of upland grass seed. Supply and spread 3.04 tonnes of granulated lime. Supply and spread 60.8kg of Phosphate fertilizer. 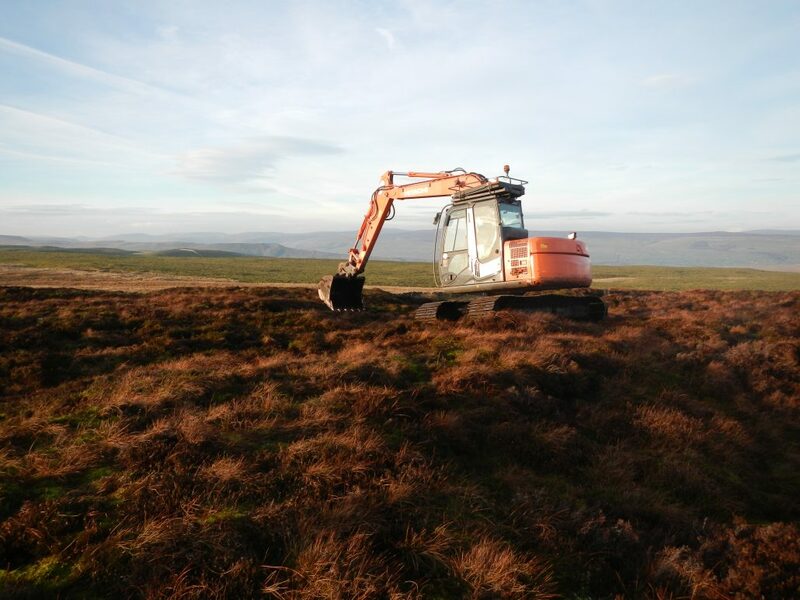 Supply and cover 5.32ha with double chopped heather brash (1100 tonne bags). Helicopter lift of all revegetation materials onto site. GPS mapping of all work carried out. Three 7 tonne Hitachi 360 excavators fitted with extra wide 900mm tracks and power tilt attachments. John Deere tractor with bespoke Rytec flail mower collector. 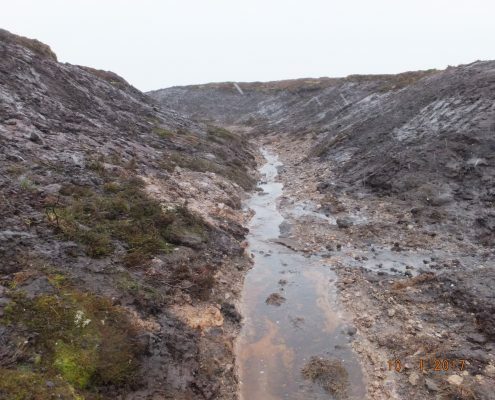 Work began, using 7 tonne excavators, to re-profile the eroded gully sides and hags using vegetation from the previously over hanging drip edge to revegetate the exposed peat. Re-profiling helps to stabilize the gully sides and therefore reduce erosion caused by surface run off. 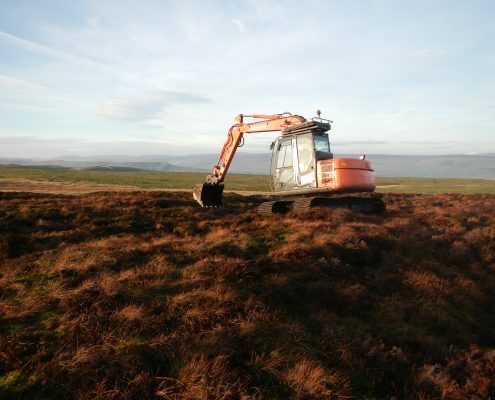 An experienced excavator operator then moved on to installing peat dams at intervals along the gully to slow water leaving the moorland, further reducing erosion of the peat. 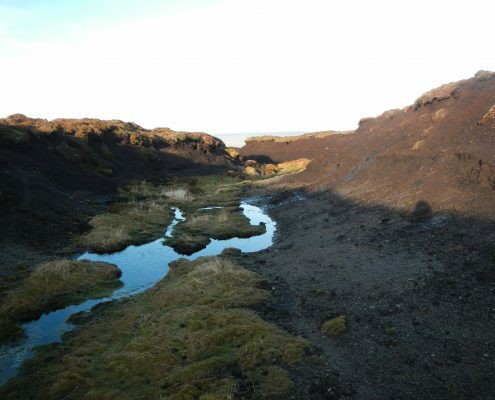 Where severely eroded gullies could not be revegetated due to the lack of suitable vegetation. 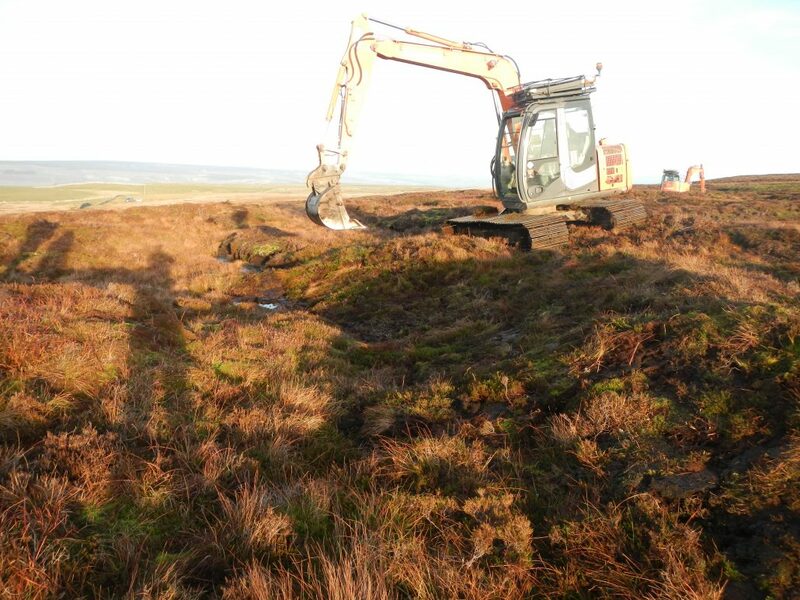 Bags of double chopped heather brash were cut using a tractor and flail mower from a donor site nearby and then flown onto site using a helicopter. 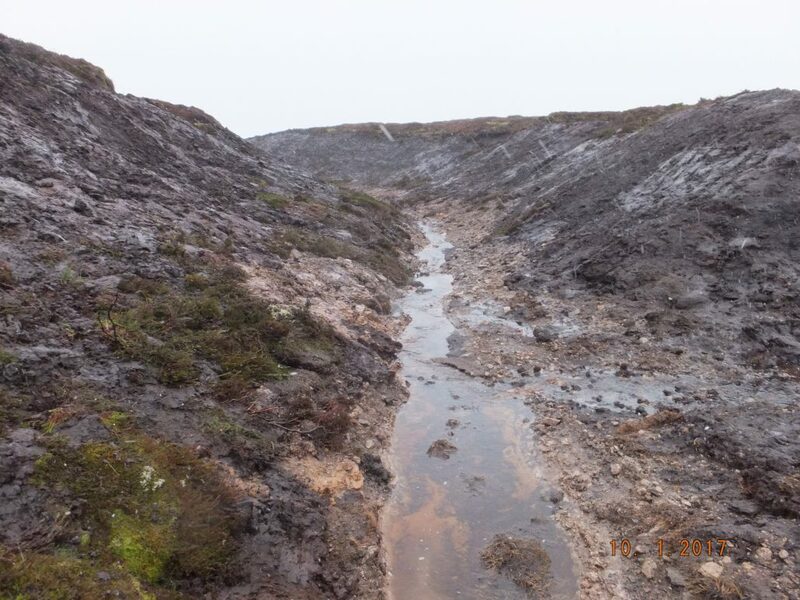 These bags were then spread to cover the exposed peat to encourage regeneration of native vegetation.